The name of this website is dedicated to my dearly beloved son Jelle. Our cats have a good life. Our property is rurally located, and therefore our cats are usually outside. They run pretty loose around our house, surrounded by a lot of land and pasture. Our property is also surrounded by a green Hornbeam. This gives our cats the opportunity to live in their natural habitat. And they can develop their natural instincts. As in climbing trees, catching mice and play. Our cats are more outside than inside. Especially in the Spring and Summer season. - Bloodtyping AB (DNA test). Our Females & Males are kept parasite free. And our veterinarians are keeping our animals carefully under control. If you choose one of our beautiful kittens to buy, our Cattery has done everything to make your pet healthy to give. All our kittens leave the nest between 12 and 16 weeks old. They have a pedigree, a European passport, are vaccinated, and dewormed, are microchipped, parasite free, potty trained and well-bred. They are vaccinated one time at an age between 10 and 12 wks old. The second vaccination will be for the new owner. From experience we have chosen not to vaccinate under 10 wks, our kittens often are still seriously ill from the vaccinations and from 10 weeks that they can handle it much better. They often need to recover when there is still a grafting reaction occurs. All our kittens and cats gets boiled fish in the morning, and in the evening cooked chicken, in addition, they can also eat dry cat food all day like Royal Canin. The kittens get this food with them when they move to their new owner. The new owner can then slowly change the food to what they want to give themselves. Of course we give advice to the new owner about the diet of the kitten. We will be very selective in terms of choice for finding a good home for our Kittens.. When buying a kitten we require a deposit of 200 euros. This is because both the buyer and the breeder have security concerns purchase. If canceled for whatever reason, the deposit is for the breeder. If you are looking for a beautiful, distinctive, healthy kitten, then you are in our Cattery Dreams Of Heaven at the right place. 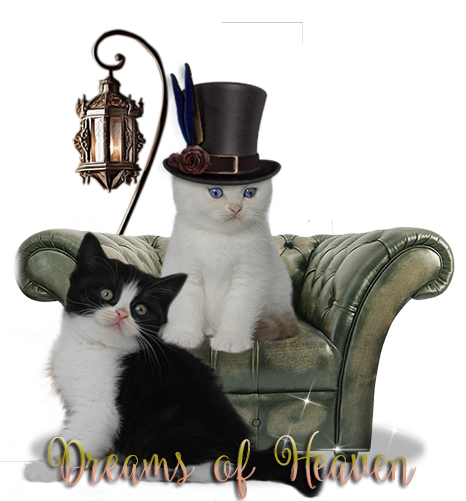 You can visit our web site to keep an eye, and contact with Dreams of Heaven.